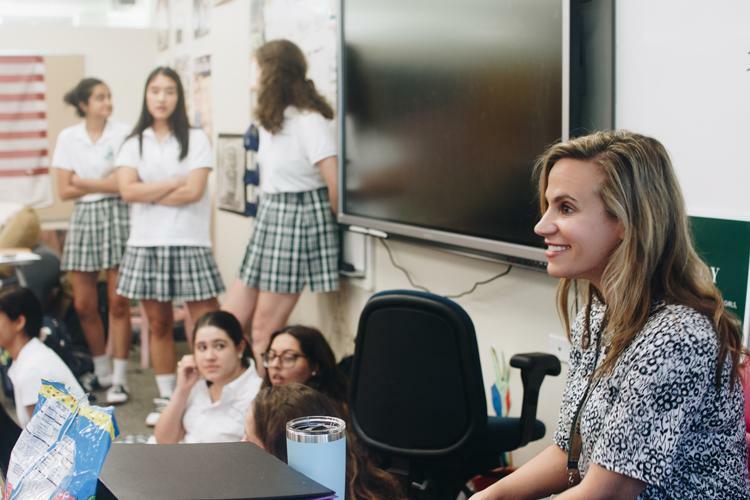 //PICTURED ABOVE: Upper School history teacher Tracy Walder leads a Model United Nations club meeting. She has to balance teaching, working with students, sponsoring various clubs and raising her child while simultaneously writing her book. For the average person, writing a 30 chapter autobiography that even merits a television show would be a near, if not entirely impossible task, but for Tracy Walder, Hockaday’s very own ex-Central Intelligence Agency and Federal Bureau of Investigation agent and Upper School history teacher, 30 chapters isn’t enough. Walder spends every free moment she has before and after school filling the pages of her upcoming memoir—which is supposed to make its debut in the summer of 2020—with details of her life as a student at the University of Southern California, FBI and CIA agent, history teacher and mother. “I am literally just regurgitating my life, just obviously in a more coherent way,” Tracy Walder said. For the past two years, Tracy Walder has occasionally written for the Huffington Post, where—according to her—she was able to develop and refine her writing skills. This job prepared her to write her memoir—an opportunity that most first-time autobiography authors do not often get. Despite her extensive writing background, she still had her literary agent, Gail Hochman from the Brandt Hochman Literary Agency, hire collaborator Jessica Blau. Blau aids Tracy Walder with the creative portions of her memoir, especially when it comes to describing the much more regular, everyday parts of life. “Part of my job is to take out the boring parts of Mrs. Walder’s job, the boring parts of her life, brushing her teeth, for example, so that I can create a heightened sense of reality. That’s what good books and movies do: they show you life, but they take out the parts that aren’t interesting,” Blau said. When memoirs are submitted to publishers as proposals or outlines (which are approximately 80 pages), the full book is not submitted. Rather, upon signing with a publisher, the process of writing the book then begins. Tracy Walder started writing her memoir in 2016, and she plans for it to be published in 2020. Her husband, Dr. Ben Walder, had initially brought the idea to her to write the book. While writing takes up a considerable amount of time in her life, Tracy Walder ensures that her daughter and her job as a teacher her top priorities. “I’ll wake up at 4:30 a.m. and I’ll work on it; and then usually I eat lunch in my room and I will work on it at lunch. Then, after my daughter goes to bed around 7:30 p.m. I will work on it because I won’t let it interfere with her or school,” Tracy Walder said. While waiting for a publisher to purchase the book, Blau gave the proposal to Newman in hopes for a possible television series to be made of the book. This past summer, on July 3, just before Tracy Walder boarded a cruise, her agent Elizabeth Newman called to inform her that not only had St. Martin’s publishing company wanted to publish the memoir, but also that the television world had caught wind of the up-and-coming book. Both the 21st Century Fox Media Company and the American Broadcasting Company (ABC) were interested in making Tracy Walder’s life story into a television series. After much careful consideration of both propositions, Tracy Walder decided on the deal with ABC. “I selected ABC for a few reasons. First, I had to consider which deal had the best chance of making it to a series production. The ABC deal had a network, a studio, a showrunner (Wendy Mericle) and producers (Calamity Jane and Timberman-Beverly) attached to it; whereas FOX simply came with the studio. The ABC deal, because all parts were in place, made the most sense,” Tracy Walder revealed. Soon after this advancement, head of Calamity Jane Production Company and television star Ellen Pompeo reached out to Tracy Walder in regards to the television series. In August, Tracy Walder flew to Los Angeles, California and met Pompeo at her house to discuss the television show’s future. While Tracy Walder was on the senior retreat at Allaso Ranch in August, another production company, Beverly Timberman Productions, contacted her, explaining that they wanted to be added to the ABC deal by taking part in the production of the television series. This is not out of the norm—often times, successful TV shows have more than one production company behind them. Also, as a result of the ABC deal, the showrunner of “Desperate Housewives” and “Arrow” Wendy Mericle chose to be the showrunner for the television series. “I really wanted to do a show about a woman who was a real life hero and I sort of came to ABC with that agenda of trying to create my own show that would be with a woman at the center,” Mericle said. With both the television series and the memoir in progress, Tracy Walder is just trying to let it all soak in. “I am more in a state of shock because everything happened literally less than a month ago—there was so much not going on for so long and it was just all of a sudden, and then school started. I am just trying to keep my head above water,” Tracy Walder said. One of the main focuses the television series plans to emphasize is the idea of female empowerment and the surge of women occupying traditionally men-held, governmental jobs. Timberman-Beverly Producer Katie DiMento, who is also assigned to work on Walder’s television show, wants the show to empower young women. “We aren’t trying to make this fancy. We want to show that women can actually have this career I think if they want and the most unlikely person in her mind anyway ended up doing this, and ended up doing it incredibly well,” DiMento said. Laura Holstein, Calamity Jane producer, is very involved in the process of making Tracy Walder’s book into a show. She often speaks with Tracy Walder to keep her up-to-date with the television series.